Sunday 9 June 2019, 7.15 - 9.45 pm. Places available. Book early - there is a maximum of 20 places per tour. Bookings for four or more people - only $10 per person! Bookings can be made via bank transfer or PayPal. Friends of South Brisbane Cemetery Inc. Experience a True History tour. 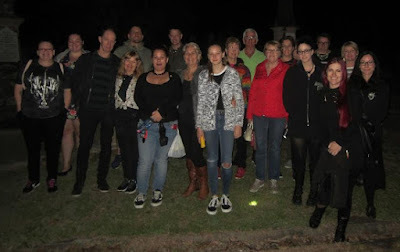 On this special night tour you will visit the grave sites of various people associated with the history of hanging in Queensland, including the hangman and all the people he hanged, as well the judges, gaolers, under-sheriff and doctors who all had a hand in the process. You will hear the fascinating backstory to hangings - how they were carried out, how they changed over time, and why Queensland became the first part of the British Empire to stop them. 'Hangman's Walk' will be led by Christopher Dawson, one of Queensland's leading capital punishment historians. He is the author of several publications and journal articles on hanging, and has presented several public talks on the subject. He is also happy to take your questions during the tour. Please note: This is a history tour and will not mention anything about 'ghosts'. Suitable for ages 12 years and up, contains adult content and graphic imagery. Up to 2.5 hours (tour times can vary depending on levels of customer interaction during the tour). We can organise a tour just for your own group of friends. You can select any tour type you want. Minimum cost is $150 for up to 15 people (extra people $10 per head). These tours are not-for-profit and run by the Friends of South Brisbane Cemetery (Inc.) in partnership with the Boggo Road Gaol Historical Society (Inc.). Tours are conducted under license from the Brisbane City Council. All profits go towards our cemetery heritage projects and FOSBC community activities. Please contact friendscemetery@gmail.com with your queries. This is a 'true history' tour and we are in NO way associated with the 'Ghost Tours Pty Ltd' small business.